But what about other ‘links’ in the production chain? An example is an injection moulding machine which may have had its hydraulic oil changed and filters replaced. But is its heat exchanger performing efficiently? Hot water is known to release and deposit limescale, which in combination with other contaminants and corrosion can reduce the cooling capacity of a heat exchanger, leading to oil overheating and degradation. The use of additives in the main factory water system can help, but contaminants stay in circulation, there is no equipment ‘flushing,’ and expensive additives are continually diluted. The solution to all these issues is the scheduled de-scaling and cleaning of all circuits that carry hot water. 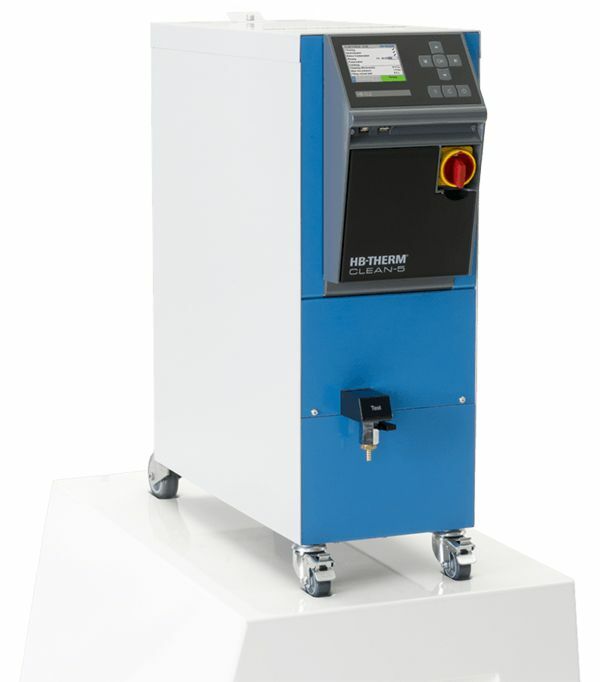 Specialised equipment such as the HB Therm Clean-5 unit can clean water circuits without the need for stripping down tools, heat exchangers or TCU’s. An integrated logbook tracks the cleaning process and provides downloadable data that can be analysed and recorded. Once items such as mould tools have been thoroughly cleaned, shorter cleaning cycles can be scheduled and implemented to maintain levels of cleanliness. So, what improvements can you expect to see if you implement a scheduled de-scaling and cleaning program? Improved production levels. Tools and dies with pristine waterways can remove heat evenly and efficiently. For example, an injection moulded part will take less time to cool and will be less likely to distort. Reduced energy costs. Factory cooling systems are subjected to less ‘strain’ if tools and heat exchangers are correctly maintained. This is particularly relevant in the warmer summer months. Reduced maintenance costs. This relates to both labour and repair costs. An example is removing the need to strip equipment and manually ‘drill-out’ blockages, or by reducing the load on a TCU’s pump. In conclusion, de-scaling and cleaning equipment can be an effective addition to your preventative maintenance program. In our own experience, companies that have purchased a Clean-5 unit have seen major benefits and frequently go on to buy additional units. If you would like more advise on how HB Therm can help to improve your current preventative maintenance program, then please contact Pete Adams on 01925 644100.